Ran qPCR with VtpA primers on cDNA and DNA (from yesterday) of C.gigas larvae to see levels of V.tubiashii compared to their water filter samples (see 20120326). Master mix calcs are here. 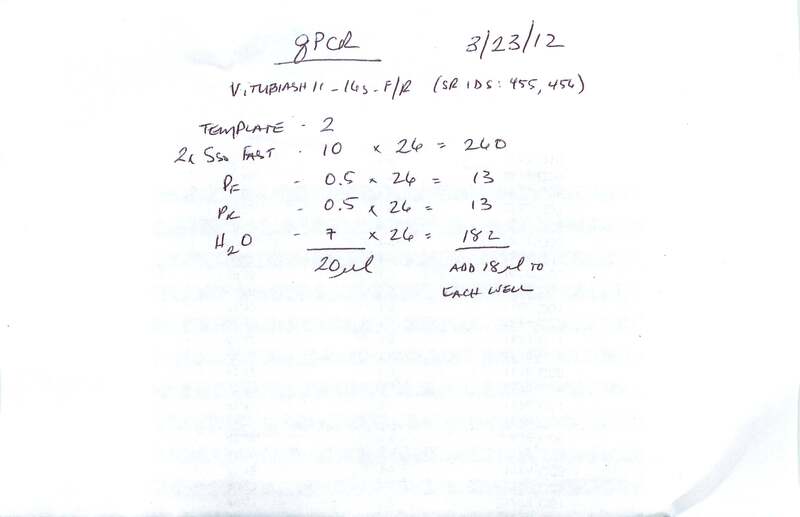 Plate layout, cycling params, etc can be seen in the qPCR Report (see Results). 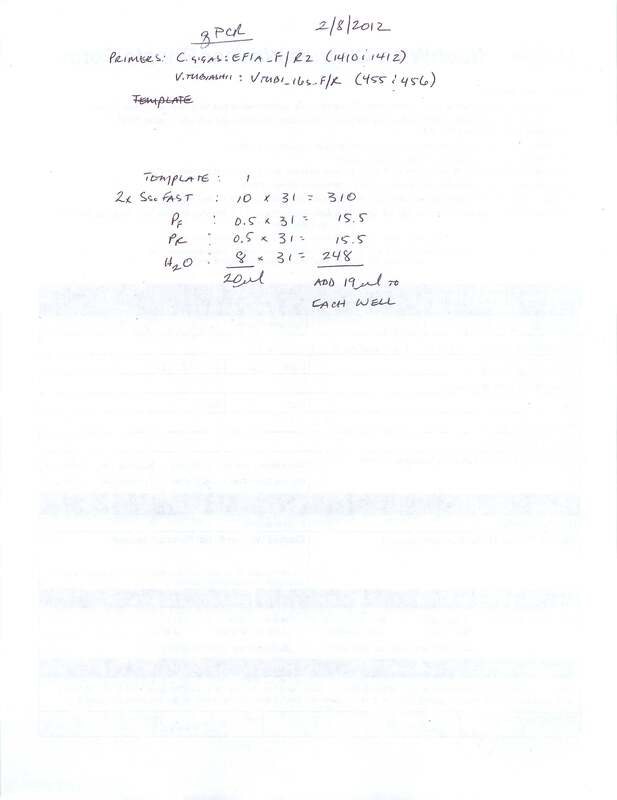 Used 1uL of cDNA and 100ng (1uL) of DNA as template. No detectable levels of expression (or, no expression at all) in any of the cDNA samples. Below I’ve put together a very rough comparison of larvae levels, based off of the the standard curve. I have NOT done the full back calculations!! This is data straight out of the qPCR machine, using the standard curve. Due to the large range, I’ve graphed the data on a logarithmic scale so all the data is visible on the graph. This entry was posted in Miscellaneous and tagged CFX96, Crassostrea gigas, larvae, Pacific oyster, qPCR, Vibrio tubiashii, VtpA on 1 May, 2012 by kubu4. 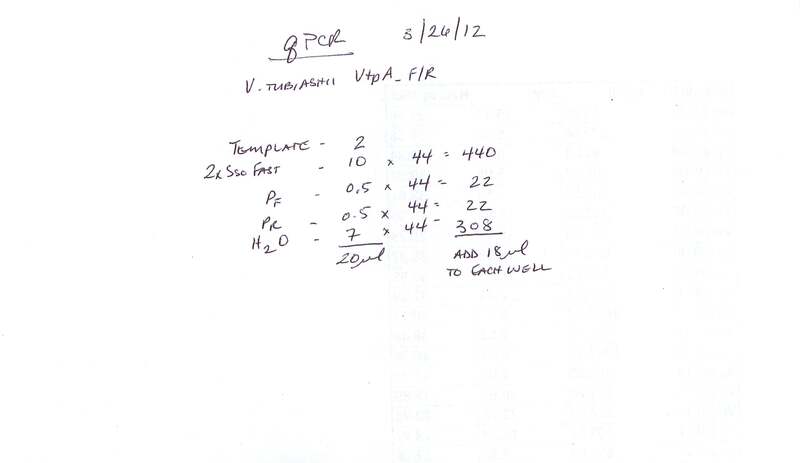 Ran qPCR using V.tubiashii VtpA primers (from Elene; no SR ID). Used 0.5uL of each DNased RNA sample, which equals ~40ng of RNA, which would be the equivalent amount of RNA that would end up in a qPCR rxn after cDNA has been made (using 1uL of cDNA). Used the filter DNA extraction from samples #279 from DATE as a positive control. Master mix calcs are here. Plate layout, cycling params, etc. can be found in the qPCR Report (see Results). All samples showed up negative, except for the positive control. Will proceed with making cDNA on Monday. This entry was posted in Miscellaneous and tagged CFX96, Crassostrea gigas, DNased RNA, larvae, Pacific oyster, qPCR, Vibrio tubiashii, VtpA on 27 April, 2012 by kubu4.